At Týrsday our main focus is helping our clients share their story. This calls for top of the bill technology, so we are proud to introduce "Remix" to you: your easy way to make beautiful curated blogs and articles. Remixing content is becoming more important in this age of curation. There is so much content out there, so why create everything from scratch if you can also use blocks built by others. Quite often you find interesting content while scrolling the web, maybe in the timeline of your social media, maybe someone sends an app or email to you or maybe you stumble upon a great video in YouTube or Vimeo. As often you find something interesting in the physical world around you. You take a picture, shoot a short video or make a GIF or Boomerang. This content always gets lost, you email it to your self, put in in a Google Doc or in a list in Notes or you just forget about it. If you try to organize the curation of this fresh content right away, the process of copy-pasting, switching between mobile content and desktop, and transferring content between apps is never efficient. That's why we came up with Remix. A simple tool to curate content in a way that minimizes steps, saves time and eliminates room for error. Remix allows users to save content (images, texts, videos, links) from the Internet, your mobile phone (for instance from your camera roll) and many apps directly to your Tag The Love platform Library, from this library you can create a blog post in a matter of seconds. We've created smart apps and a Chrome extension to make this as simple as possible. You can save almost anything to your library and instantly reuse the content in your posts. Check this video to see how it works. Next to the mobile app there is our Chrome extension. This allows you to save content directly to your platform library without the hassle to store content locally and upload it. Anything you stumble upon online can be turned into a rich blog within seconds. 2. click add to post to start writing a blog with this remix. Or save a few finds for a nice listicle blog or a later moment. Download the apps and start curating content for your own social website. 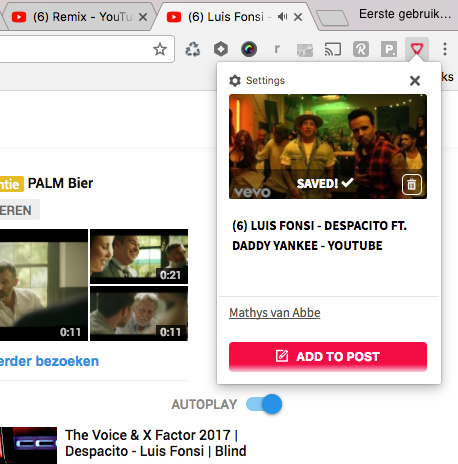 Chrome extension - install it now! All Týrsday clients get to use Remix for free. Don't have it? Contact us. Want to start with easy content sharing? Contact us. More info about our technology, check the Tag The Love website.